It was a fitting way to begin an out-of-this-world show: against a screen that played an epic outer space cartoon, Antwan André "Big Boi" Patton took the stage to "ATLiens," the eponymous hit from OutKast's 1996 album that had the thick and happy crowd throwing their hands in the air at the chorus's prompting. "We're gonna go to the southern planets to the Boomiverse," the MC and one-half of the iconic Atlanta hip-hop duo — representing Canada with a maple leaf-emblazoned cap — announced. 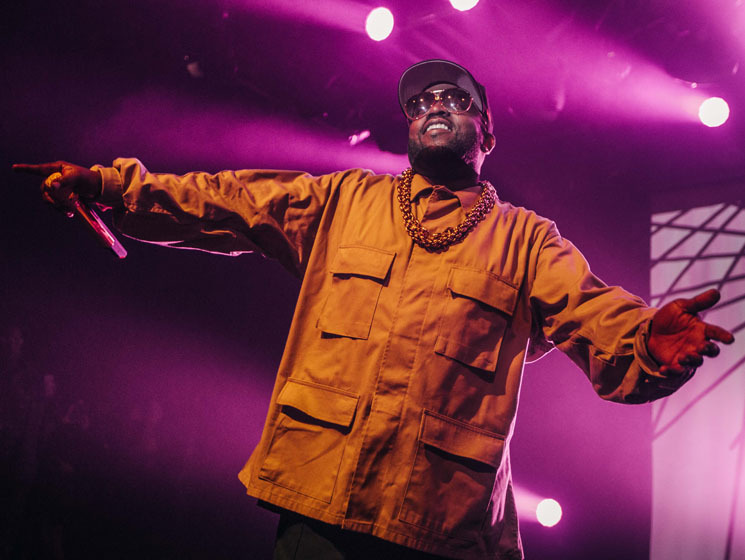 And he did, whisking the audience away on an exhilarating odyssey through his extensive catalogue, from a wide spectrum of OutKast tracks to a variety of cuts from his solo efforts, including 2017's Boomiverse. With longtime Organized Noize collaborator Sleepy Brown by his side — who filled in with André 3000's part on OutKast songs — Big Boi was effortlessly cool and charismatic: boogying, smiling, constantly interacting with the audience and thanking them for their energy. His delivery was impeccably smooth and sharp, especially impressively so when he spat verses at his signature turbo speed on "So Fresh, So Clean," "The Whole World," "GhettoMusick" and "B.O.B." The set list was expertly curated: newer material stood up seamlessly against more seasoned stuff, delivering a spirited performance with depth. Boomiverse's aggressive "Kill Jill," jaunty rag "All Night" (which, with a wide grin and playing air piano, Big Boi visibly enjoyed performing) and swaggering "In the South" flowed beautifully into the glimmering "Shine Blockas" and bopping "Shutterbug," both from Sir Lucious Left Foot: The Son of Chico Dusty. Classics "Skew It on the Bar-B" and "The Way You Move" had the entire room throbbing. In turn, the atmosphere was at once feel-good and exultant. The crowd danced, sang along with every chorus and had their phones out, especially on OutKast favourites like "Miss Jackson" — an obvious highlight. It felt almost nostalgic and served as a reminder of Big Boi's artistic brilliance and much deserved longevity. "International Players Anthem (I Choose You)," the encore, got perhaps the biggest cheer of the night, with the song's iconic music video playing on the screen. After his last verse, Big Boi took a photo with the crowd and graciously thanked them for their vigour. The sentiment was reciprocated — excited gushing carried all the way out to the street and blocks away from the venue.